Direct Lease Driver of the Month, Charlie Peyton, Jacksonville, N.C., is a veteran driver with 37 years of experience as a professional household goods mover with our company. This is his seventh Driver of the Month award with the van line. Charlie also was selected as Driver of the Year in 2002. 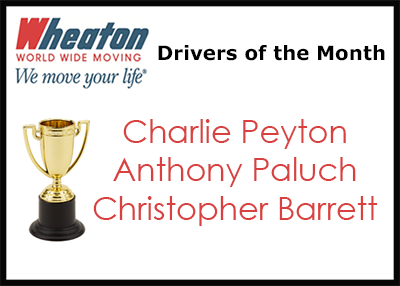 Anthony Paluch, Colorado Hi-Tec Moving & Storage, Inc., Denver, Colo., earned Wheaton’s Permanent Fleet Driver of the Month award. Tony has more than 18 years of experience as a professional mover and maintains a great performance rating. This is his fourth Driver of the Month award. Christopher Barrett, Breda Moving Co., Inc., Roselle, Ill., earned Wheaton’s Intermittent Fleet Driver of the Month award. Chris is another veteran driver with more than 32 years of professional moving experience. He maintains a top performance rating and this is his first Driver of the Month award with the van line.